This page illustrates the steps to be taken by authorized representatives (AR) and additional authorized representatives (AAR) affiliated with accounts in the registry, to carry out a transaction. 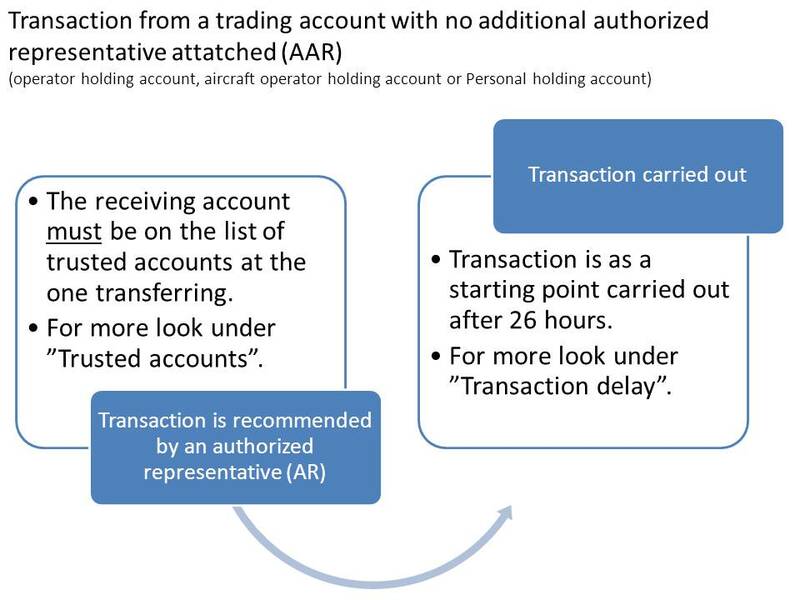 There is a difference between whether a transaction is initiated from a holding account or a trading account and whether an account has one or more additional authorized representatives (AAR). 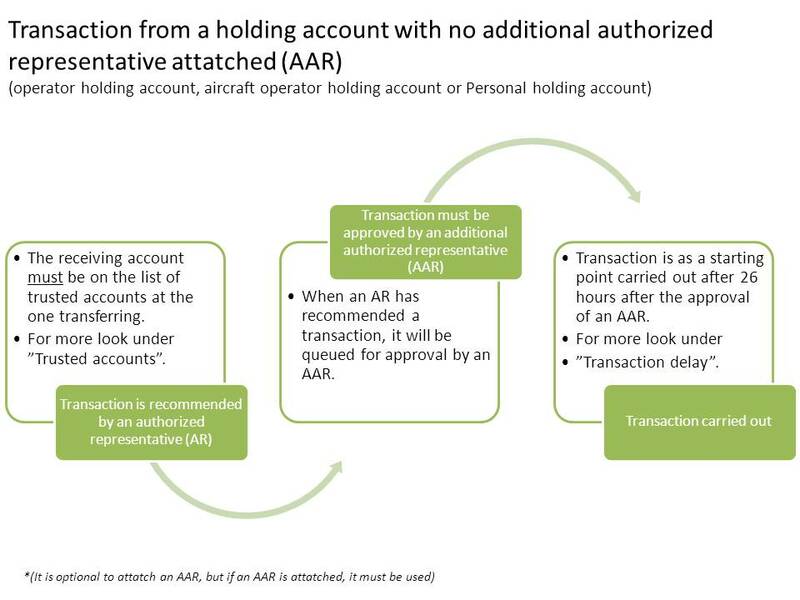 The general rule is that authorized representatives (AR) affiliated with an account may carry out transactions without the approval of an additional authorized representative (AAR) by using the trusted accounts function. 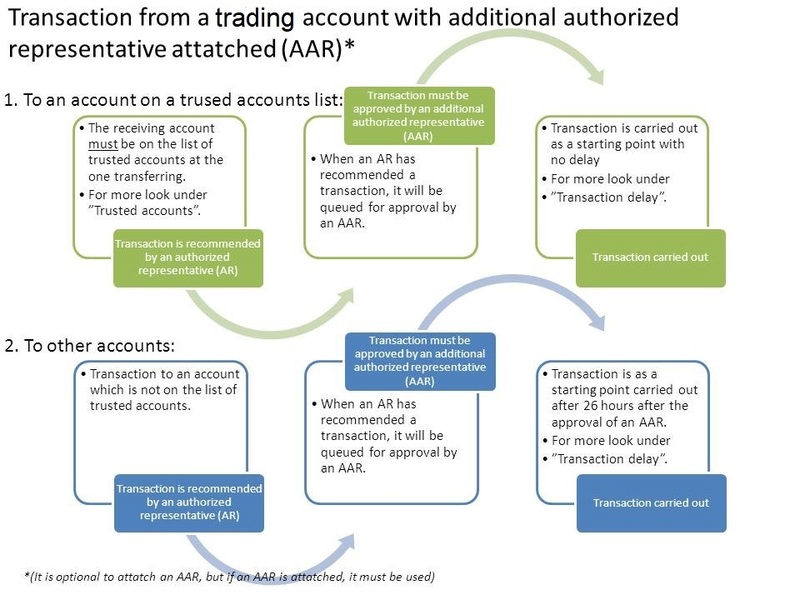 Transactions initiated from trading accounts may also be carried out to other accounts if the initiation of the transaction has been approved by an AAR. If additional authorized representatives (AARs) have been designated, they must also approve the transactions. The account holder is free to choose whether to associate AARs with its account. If one or more AARs have been designated, however, they must be used. For all types of account, the designation of one or more AARs means that the initiation by an AR of a transaction to an account on the list of trusted accounts must be approved by the AAR(s). This is a “four-eyes principle” in which the AAR serves as an extra security measure. A trading account must have the approval of an AAR to carry out transfers to accounts which are not on the list of trusted accounts. This is not possible from a holding account.